be as universal as we like to think. The Bright Hope Baptist Church sits at the corner of 12th Street and Cecil B. Moore Avenue. This structure, built in 1964 after the construction of Yorktown, serves an active congregation that was once led by William H. Gray, III, a prominent Philadelphia politician and one-time majority whip in the U.S. Congress. A large stained-glass window is displayed on the church’s Web site, depicting Jesus surrounded by glowing rays. This Jesus is shown just how he is commonly portrayed—kind, bearded and smiling. One thing is different, though. He is black. 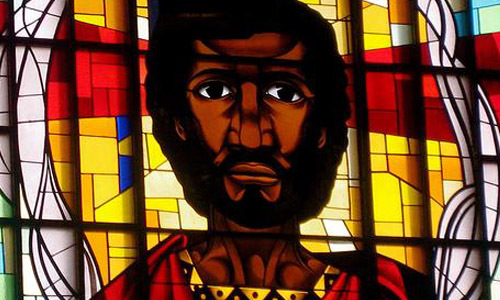 Now, Jesus could actually have been black. Some schools of thought point to evidence that early Jews may have been at least partially black. Regardless of what the historical Jesus looked like, however, churches and religious paintings and symbols depict him in dozens of different ways. These vary from the traditional crucifixion scene to more contemporary, and often less frightening, images. Depictions of Jesus and almost any other religious figure change over time and place, in order to fit the mood, so to speak. What Jesus looked like in real life is not completely clear, and that makes depicting him in different ways easier. Even if the world knew precisely what he looked like, I doubt that he would be depicted the same everywhere. Religious figures, whether they are saints, gods, martyrs or angels, give us comfort, and their stories are told to give us some spiritual connection, or at the very least, a social connection. These stories lose their meaning and their ability to connect to us when they do not reflect ourselves. A story of European monks who were trying to convert people of color shows what happens when people do not see themselves in their deities. The monks were appalled when they were told that these people preferred hell to heaven. A painting that depicted the two eternal worlds turned out to be the culprit. It depicted heaven as a place populated with austere, pale people, who lived in the sky. Hell, on the other hand, was shown as a place that had a lot of bonfires, and that was populated by dark-skinned people. It isn’t hard to see how anyone would rather live in a place with warmth and people who at least partially resembled themselves rather than a bizarre foreign land filled with stone-faced strangers. Perhaps it is better this way, with people who claim to worship the same God depicting him in sometimes drastically different ways. Even if we knew what Jesus looked like, depicting him that way would hardly make him more real to the millions of us who say they believe in some form of God — 86 percent of American adults, according to a recent Gallup poll. For God, or religion in general, to serve any worthwhile purpose, he first needs to connect to the people who are searching for meaning in his story. Stephen Zook can be reached at stephen.zook@temple.edu. The SRC approved five of 39 proposed schools in a Wednesday meeting. Few students expressed interest in the program. The Hebrews in the New & Old testament resembled Egyptians in appearance (The Bible states this repeatedly). Egyptians were of Black African stock but mixed with many nations. An afro-semitic look seems most historically accurate. I found an ancient piece of art depicting an Israelite in Rome. This person looked somewhat black, but also very middle eastern. In light of all of the atrocities that have been done in the Messiah’s name toward people of color this subject remains relevant. YAHSHUA IS THE WAY!!! P.S. actually that stained glass doesn’t look too much different from the pic I was mentioning. I have a painting on my website depicting YAHSHUA in a more historically accurate way. My DAD knows what i look like, thats all that matters!